I can hardly wait to share this makeover with you! I feet I made a break through with discovering a new product that did wonders to a piece of furniture! Maybe it’s nothing new to some of you, but for me it was. As I type I’m almost twelve hours away from home, at Hilton Head, SC. Hubby, the boys and I came down here with a load of furniture that we hauled for someone and decided to stay an extra day. Unfortunately it has rained most of the time. Though the rain is a nice warm rain, it did hinder us from having beach time. We got to explore some shops and of course have spent a lot of quality time as a family traveling for hours together. Nobody did anything strange, such as chewing tobacco or mannerlessly feeding their face with cotton candy. Then there’s always the bubble blower..
As the rain started to move in, we were blessed to see a double rainbow in the mountains. I wasn’t able to get both of them in the picture, but you can see the beauty of one of them.. Okay, enough of our travels and back to the makeover. I had the privilege of working with a family heirloom that is dated way back to the 1800s! The beautiful old cupboard needed to be renewed and I admit I was a bit nervous to try something new with it, but it ended up turning out great then! This is the product I did a little research on and ended up using on the hutch. The product can be used over old stain, without removing it. I tried to pick out a color that was close to the original. The name “honey” sounds like a light brown color, but this ended up being one of the product’s darkest colors. Here is a picture of the piece before I did anything with it.. I sanded the cupboard down, to remove any dirt and peeling finish. I then began to apply the stain using a bristle brush. I am so impressed with this product! It did a great job of renewing the piece and it wasn’t difficult to accomplish. The hutch is made of various types of wood, which adds character to the piece. The bottom right door is naturally worn on the top left corner from people taking a hold of it to open it because of a missing latch. It’s so neat to think of all the stories this piece could tell! This inside still has it’s original vintagey green color, which I love! I am grateful to my friend/neighbor for trusting me to work on this piece! I love trying new things with paints and stains and have already used this product on my own makeovers. So if you have an old piece, or any piece of furniture that you want the grain still showing and don’t want to go through the tedious and smelly process of stripping it, I would definitely recommend Polyshades, by Minwax. We have a local thrift store that just recently moved to a new location across the street from where they were. The day I stopped in was their grand opening day, which I hadn’t realized when I turned into their parking lot. I soon found out. After finally managing to find a parking spot, I hesitantly walked in. I have never seen a thrift store so full of people! I almost walked right back out but my curiosity drove me on. Some of the aisles literally had a line you had to stand in to walk through. Anyway, I did find some great bargains so it was well worth the chaos. I found this coffee table and instantly claimed it. I wasn’t fond of the basket weave drawers, so I tore that off, along with the trim around them. I made my own chalk paint for this piece. I used un-sanded grout to make it. If you have my book, you will find the recipe in there, along with two other recipes using plaster of paris and calcium carbonate. I gave the table two coats of chalk paint and topped it with a new product I absolutely love called bowling alley wax. I also covered the drawer fronts with contact paper and trimmed them with thin strips of wood. I love how smooth the surface feels with the wax on it. Again the before and after..
Never overlook an ugly old piece of furniture. It may have potential! This table will also be at the vintage fair, as will most of the makeovers I have been posting. I am becoming so excited for the Walnut Creek Vintage Fair 2016! It will be held on June 25th from 7-4 in the parking lot of Walnut Creek Furniture. This year they are planning on having all the vendors under a big tent, which I’m so excited about! For those of you that remember how last year’s fair day ended up being the most rainy day of the summer, this is certainly a great thing. No more wading through mud and water with umbrellas bumping against things. For the vendors, no more collapsing tents and the worry of things being ruined or blowing away! My days until the 25th will be filled with doing one of my favorite things.. creating and repurposing! Finally I’m all caught up with paint jobs and am free to wander through the shop thinking of what I’m in the mood to work on in preparation for the vintage fair. Following are a few pictures of my booth in 2014 and 2015. Of course you can’t tell by the pictures above what all was going on outside the tent, but trust me, it was a bit nightmarish! Now, on to the Monday makeover.. I picked up this little black end table at a thrift store..
First I painted the top white..
As I waited for the top to dry, I printed out a design I liked from google images to make some stencils with.. I cut out two of them so I could dry one, while using the other. I eyed the top of the table to find the middle and began there. I used a gray color to fill in the design. I moved the stencils from one end to the next so I wouldn’t be working on wet paint. I also turned a fan on the paint so it would dry more quickly. After painting the rest of the table in gray, it was done! I thought since we’re in this beautiful season of spring, I will share a few snapshots I took of God’s beautiful creation showing off it’s spring colors. My sister has these awesome flowerbeds filled with perennials of all sorts, rocks and other natural things. The one I’m featuring today is located on a slope, so low growing plants, such as Ajuga, Sweet Woodruff, Hostas and Forget me nots, just to name a few, look great in it. Don’t you love the color combination? My sister sells her plants on Etsy. You can visit her shop here. Now, on to a makeover..
A few weeks ago I spent a number of days painting wainscoating, trim, doors and walls in a home. This can be quite time consuming, but well worth it. All of the trim,wainscoating and doors are oak and had turned orangish in color. I applied three coats of Do It Best paint/primer in one on these surfaces. Everything was painted white but the kitchen wainscoating and a small hall vanity was painted gray. I will have more on the kitchen later this year since I will possibly be painting the kitchen cabinets too. For now, here are a few before and after pics..
A few Mondays ago I had posted some furniture makeovers here. One of the pieces, a chest of drawers, resides in this home.. The blue wall color is called Mystic, by Do It Best. I loved this little plant that was fixed up by the ten year old daughter that lives here. I didn’t get very many pictures, but you can tell what a difference once again that paint can make in a home!Have a great week, everyone! Greetings on this Monday morning everyone! Is anyone else enjoying this season of spring like I am? Seriously, what could be better than falling asleep to the sound of spring peepers directly outside your bedroom window and waking up to birdsongs ringing through the woods? The color green is so vivid this time of year, you can almost smell it! Here and there other colors are bursting forth..it’s like a land of magic. Our God is an awesome God in all his ways. To think that he created these things for our enjoyment is so much more than we, or I, deserve! I praise Him for it. I love entering my little greenhouse shed and smelling the rich, damp soil of plants. Earlier this year I started some seeds, and though they didn’t all germinate, enough did to give me that feeling of awe and satisfaction at being able to plant a seed and watch it grow! Now, let’s get to the makeovers.. This past week I worked on a number of furniture pieces and I’ll share a few of them with you. This antique buffet was one of the pieces..
An older piece like this always scares me a little. I try not to mess any piece of furniture up, but a family heirloom like this makes me a little nervous, though I enjoy the challenge. Anyway, back to the buffet.. I’ve started to use a stain blocker on old pieces like this. 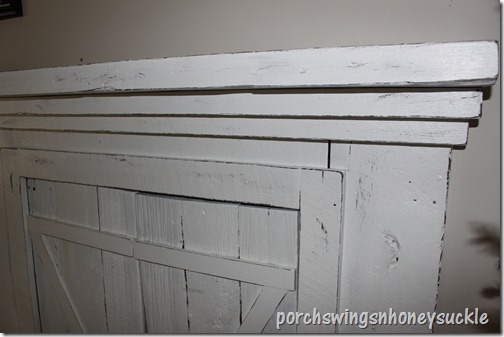 It seems some of this old wood will start to show stains once it’s painted. The product I used for this piece is called B-I-N by Zinsser. I brush it on because I had a bad experience with using it in my sprayer. To this day, I’m not sure if it’s just not meant to be sprayed on, or was it because my sprayer had a little water in it when I added the sealer and it caused the paint to become lumpy and clog my sprayer. (a nightmare to say the least!) So, I use a bristle brush to apply it. It dries super quick, almost too quickly, but once you learn how to work with it, it goes pretty good. I sand the surfaces after the sealer is dry, to even out any brush strokes. Next, I applied a very light gray, almost white paint, called Spectral. After that was dry, I used the “cheat distress” technique, which is taking a paint marker and coloring the edges or any other areas to distress. In this case, I used black. I also applied Polycrylic, by Minwax as a topcoat. I sprayed it on. I enjoy setting a piece of furniture amongst flowers or other “props” just to see the color or texture combination it creates.. I also painted kitchen chairs for a client. I didn’t get a before picture, but here is the end result. The paint color is a nice gray called Rocky Bluffs.